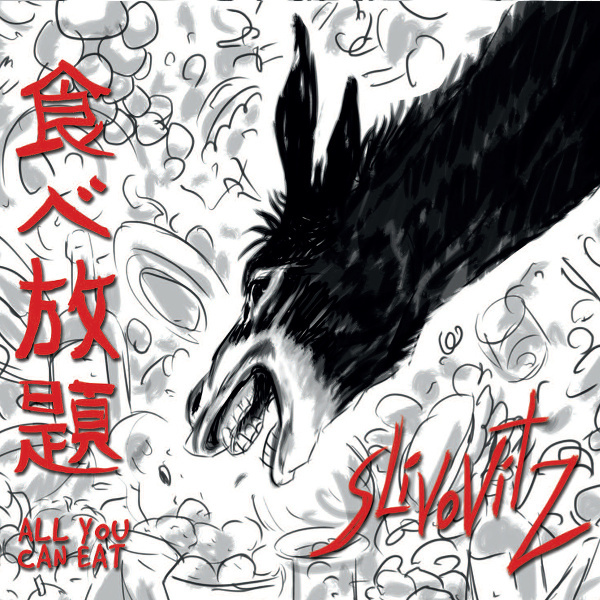 Slivovitz on their fourth album presents a mega-buffet of brilliant compositions, memorable melodies, and refined complex arrangements. The Italian based seven-piece offers an all-instrumental funky gypsy jazz style informed by rock, east-Euro folk, middle eastern themes and an all around interpretive invention that goes well beyond expectation. If their last album Bani Ahead from 2011 was a refreshing surprise, All You Can Eat will be even more satisfying. In addition to the basic electric and acoustic guitars, electric bass and drums, they sport a reed section of saxes (alto and tenor) and harmonica, plus trumpet and violin; that’s a lot of melodic and rhythmic power applied to the eight included pieces here, all penned by guitarist Marcello Giannini or saxophonist Pietro Santangelo. From the warm and stylish moodsetter “Yahtzee” to the eclectic twists and turns and general madness of “Currywuster,” to the tasty middle-eastern influences of the opener “Persian Night,” Slivovitz has it all covered with ovelapping winds and violins, punchy trumpet and guitars and a knack for brilliantly defined arrangements; one may be more-than-occasionally reminded of Grand Wazoo or Hot Rats era Zappa, but presented on a whole new level with a funkier gypsy dynamic throughout, making for a tasty feast of epic proportions. All taken, there’s a lot here to get excited about. This one was definitely worth the wait.